For this months They Go Really Well Together Challenge we were asked to create a dish using strawberries and coriander, which I have to admit didn't scare me as much as the banana and parsley challenge, but anyway...before I could create my masterpiece I first had to find out what coriander tasted like. So, to my surprise we already had a thing of coriander seeds, which kind of shocked me since we had never used it before. Opening up the jar I poured out three little round brown seeds in my hand and hesitantly put one in my mouth. As soon as I crushed it open with my teeth I got this intense flavor, which to me was a lot like black licorice, and right then I thought to myself, "Ok I can do this!" Now to the creation of my recipe---a few weeks ago when I was in Orlando we went to a restaurant in Universal Studios that was NBA themed and for dessert we ordered Cinnamon Berries. When the plate arrived I was flabbergasted! There were six deep fried strawberries served with vanilla ice cream that came in a cinnamon tortilla shell. "Hhm, fried strawberries, I don't know," was my initial reaction but after cutting the strawberry open to reveal of warm almost gooey center, it was love a t first site! 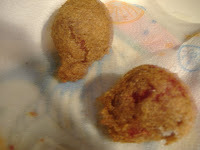 The first bite of that strawberry was so amazing that I can't even put it into words, it was warm but crunchy (from the tempura batter), still a little juicy...it was HEAVEN! When I saw that we were to use strawberries in this challenge I knew that I was going to recreate the fried strawberry masterpiece. 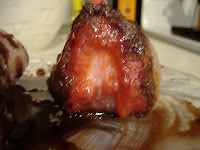 Ok, so I looked online to find a version of fried strawberries that I could use, and came up with two good looking recipes. Not being able to choose between the two I tried both! 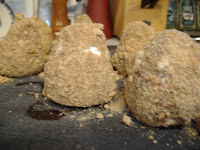 These strawberries begin with a coating of flour, which are then dunked into an egg/milk mixture and finally rolled in cinnamon graham cracker crumbs. Make sure to have all your strawberries coated and ready to go before you begin frying otherwise you'll have to take time out of frying to coat a new batch of strawberries, which in turns makes the already fried strawberries cold and we don't want that. 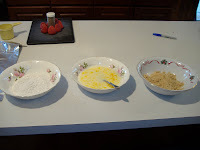 (I don't have exact measurements of the flour, egg/milk, and graham crumbs because it just depends on how many berries you're making) Ok so once they're all coated it's time for frying. 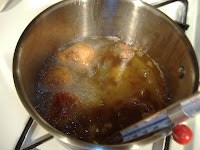 In a nice deep pot pour in enough oil so that the berries will be submerged in oil (about 2 inches). Bring the oil up to about 375 degrees and you're ready to go! 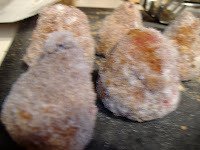 I fried to strawberries at a time, waiting until they were a nice golden brown (about 45 seconds to 1 minute), I then took them out of the oil and placed them on a paper towel to drain, then immediately rolled them in plain sugar. Continue this process until you've fried up all your strawberries. This recipe was ok, but it wasn't that thick tempura coating that I was looking for. This was more of a crispy shell kind of like what you would find on chicken fried steak. This "batter" also seemed to fall of of the berries when they were frying. These strawberries were the first of the 2 recipes that I tasted and when I bite into my strawberry I was disappointed, not because the recipe was bad or that it didn't taste good, but because it didn't remind me of the strawberries I had in Orlando, so I was praying that Recipe #2 wouldn't disappoint. Now this is what I'm talking about! This recipe hit the nail on the head! I mean take one good look at that strawberry and tell me that it doesn't make your mouth water! Out of the two recipes this one was my favorite and was so much easier than the first recipe. For the batter I used 1/4 C. of pancake mix (I only had whole wheat mix and it came out fine!) and mixed in about a teaspoon of cinnamon. I then added 3-4 Tablespoons of milk and mixed it until I got a nice thick batter. You wanna make sure not to add too much milk otherwise the batter will just drip of the strawberries. As you can see I had all my berries coated and ready for frying. Then I fried them in the same oil from recipe #1, these ones cooked a bit longer, but you're still looking for that rich golden brown color. Once golden, drain and roll in sugar. Ok so you're probably wondering where's the coriander? 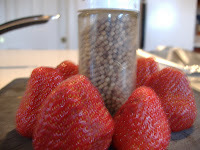 Well of course when you have strawberries you need a chocolate sauce to dip them in, so I created a Coriander Chocolate Dipping Sauce, which is so easy to make!! 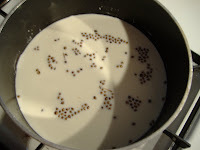 Bring 1 cup of heavy cream and a tablespoon of coriander seeds to a boil, then pour cream over 1 1/2 cups chocolate chips. 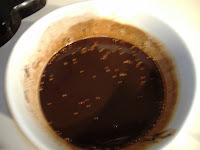 Stir until thick.-----This sauce was to die for, it was so good that I was literally eating spoonfuls of it, I know, I know, I'm disgusting but I mean hot melted chocolate, who can resist? The chocolate was so rich and creamy and them you would get a bite of coriander seed which would gently burst in your mouth, leaving you with this licoricey flavor of chocolate. The seeds were soft too, because they had been warmed by the cream. (I think next time I might try to crush the seeds). Now all that's left to do is dunk your strawberries and take a big bite! 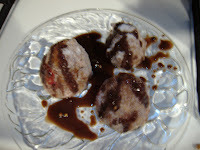 My Fried Strawberries with Coriander Chocolate Sauce will easily become a dessert that you will not be able to take your mind off of, so I apologize in advance :0) But you're gonna love it!!!!!! Check out the other creations from fellow bloggers by clicking on this link! Wow! I would have never thought about deep-frying strawberries. 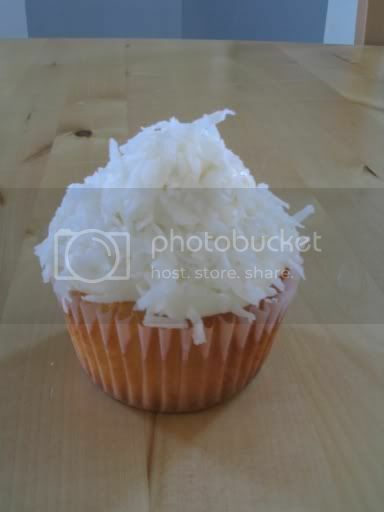 They do look delicious! I know! Me either, but they are soo good! Thanks for being such a wonderful host! Oh... wow. I'm... speechless. And oh so very hungry now. 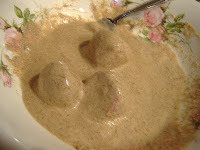 I hope you don't mind, but I've added your blog to my directory of cooking links.